As entertaining as Marvel’s Secret Wars summer was, the absence of Doreen “Squirrel Girl” Green’s ongoing series was strongly felt. Since gaining her first solo title, Doreen has become one of the most delightful characters in Marvel’s stable, largely thanks to writer Ryan North and artist Erica Henderson’s comedic take on the superhero lifestyle. 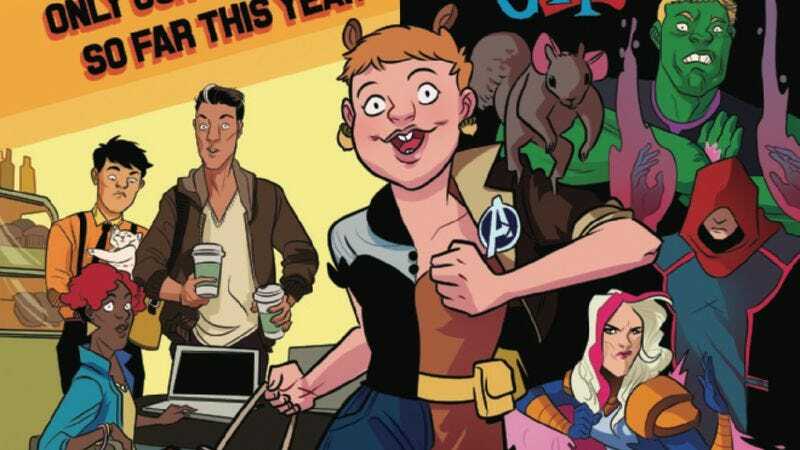 Like Ant-Man and Spider-Gwen, The Unbeatable Squirrel Girl was cancelled for Secret Wars just as its creative team was getting started, but the entire gang is back together to continue Doreen’s adventures in the book’s second volume, which picks up eight months later with the title hero as a New Avenger and a college sophomore. The series’ sense of humor is spotlighted on the cover of next week’s The Unbeatable Squirrel Girl #1, which proudly proclaims that its “only our second #1 so far this year.” That irreverent tone continues throughout this preview, which shows Squirrel Girl and friends rescuing people from a burning building and then gushing about their success as they walk down the street in full costume. North’s dialogue and Henderson’s art are full of personality that heightens the humor of the story, and colorist Rico Renzi reinforces the light-hearted tone with a bright palette of neons and pastels. Every page of Squirrel Girl radiates fun, making the return of Doreen Green one of the most exciting things about the “All-New, All-Different Marvel” relaunch.